Lionel Messi and Malcom have been left out of Barcelona's squad for Saturday's LaLiga trip to Rayo Vallecano. 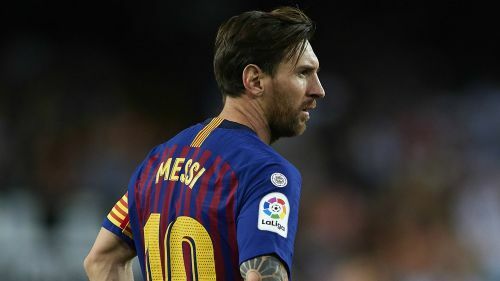 Argentina star Messi has still not recovered fully from a broken arm sustained against Sevilla on October 20, despite having resumed team training in recent days. "It's still early. He's still recovering," head coach Ernesto Valverde told a news conference on Friday. When asked if Messi could be fit for the Champions League game against Inter on Tuesday, Valverde replied: "We need to wait." Despite the absence of the 31-year-old, Valverde has decided to leave out Malcom, who made his first start for the club in the 1-0 Copa del Rey win over Cultural Leonesa on Wednesday. Denis Suarez has also been dropped from the squad, but youngsters Carlos Alena and Chumi have kept their places. Sergi Samper is sidelined with a calf injury suffered against Cultural, while centre-backs Samuel Umtiti and Thomas Vermaelen remain short of full fitness.